Rolex 24 and then some! Sometimes its the marathon that begs you to become a part of it. There's no question in racing circles that the Rolex 24 at Daytona is one of racing's most cherished endurance marathons. A true test of man and machine, the only way to understand it is to be a part of it. Forty-nine cars of all shapes and sizes took the green this past Saturday January 24 and competed for 24 hours, taking the checker Sunday afternoon. Prototypes powered by Porsche, Lexus, Ford, BMW, and Pontiac joined GT sports cars from Porsche, Mazda, Pontiac, Ferrari, Corvette, and Ford. The race featured great duels, heartbreaking part failures, and a historic win by the Brumos Porsche team, winning overall for the first time in 40 years. But, this is a story of seven days. The first four days included the preparations and running of the Rolex 24. Joe and Jerome Jacalone, owners of Gotham Competition were gracious to hire me to drive with them and two other pros, Randy Pobst and Shane Lewis. It was my first Rolex 24, and a very special personal milestone. I first walked the pit lane at age 16, watching Geoff Brabham and Chip Robinson dominate in their Nissan GTP-ZX turbos against the mighty Jaguars, Toyotas, and other contenders. I dreamed of driving in this race, but never would have thought it would take seventeen years to get here. The Porsche 911 GT3 Cup we raced was very entertaining to drive. It has fantastic power, giving a great thrill through the Daytona banking, which unlike what you see on television, is very bumpy and narrow. Imagine driving a race car you've never driven before at 170 mph while being thrown around, lap after lap, by the bumps. Oh, and watch for those prototypes blasting by you on the outside... Certainly the car is much different from the open wheel cars and prototypes I've raced in recent years, but the real thrill comes when you get to compete. Our small team did that as a true David and Goliath story. Against powerhouse teams, we finished 10th in GT, 18th overall. This race rewards consistency, which is a combination of driving fast, staying out of trouble, and staying focused. Not easy to do in a 4-hour race, and definitely much harder for 24 hours straight. Elsewhere down the pit lane my friends from Mazda had early trouble with their super fast RX-8's and were not able to repeat their 2008 victory in GT, the win this time going to the #67 TRG Porsche. One very special memory was the midnight to 3am shift I drove. I normally like to get to bed around 10pm each night. The team asked me to be available by 11pm for my next stint. I arrived at 10:45, but did not get into the car until around 12:20am. Imagine being very tired, already having driven a race distance earlier in the day. Imagine it being well past your normal sleep time. Now get in a race car and drive it for two and a half hours. Amazing how adrenaline works. When I emerged from the car, I felt a sensation like no other. Utter exhaustion, but complete happiness. Few life experiences can offer this kind of satisfaction. Those were four days. My parents drove me home right after the race, I repacked my suitcases with whatever was left in the closet, and drove myself to Sebring. What was I thinking??! It wasn't an easy drive, harder than all the race drives, but I made it to the hotel. 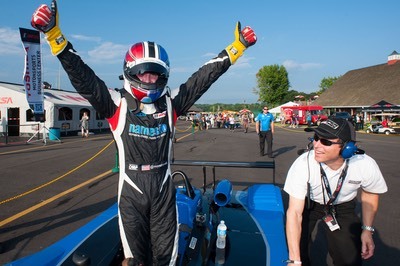 Next morning, I woke and went to the track to coach a driver in his IMSA Lites car, followed by two days coaching four drivers who drove for the powerhouse Andersen Racing Team in Star Mazda cars. I've learned that no matter how tired you are, you really can't get enough of something you love. I also reaffirmed what I've always believed that coaching and driving are equally satisfying. Those were a complete, and memorable seven days. I am finally home and looking forward to spending time with my family, making a home cooked meal, and sleeping in a few times. Driving and teaching is all-consuming, and I am sorry I have been a little out of touch the last seven days. Thanks again to Jerome and Joe Jacalone for allowing me to drive their Porsche race car. 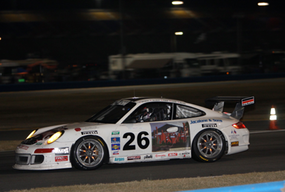 Thanks to Randy Pobst and Shane Lewis for mentoring me in a successful first Rolex 24 drive. Thanks to all the crew of Gotham Competition for your love of the sport and hard work. 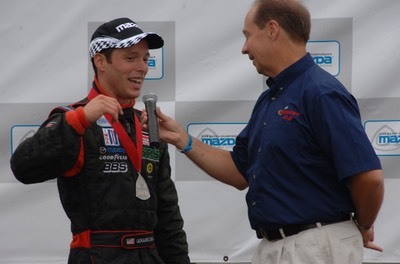 Thanks to the many of you who helped me to become a race driver. I don't yet know what's the next race I'll do, but I can assure you, it will happen. Until the next time, drive smart and have fun. By now most of you have heard about the closure of B-K Motorsports. 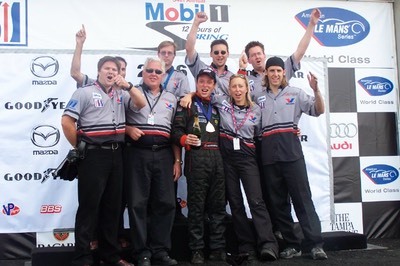 It was an absolutely fantastic experience to drive for this team in 2008, representing Mazda, BP, Mazda fans, and an awesome crew I'll miss dearly. Driving a LMP2 prototype alongside drivers like Brabham, de Ferran, Pagenaud, Dyson, Andretti, McNish, Fernandez, Dumas, Bernhard, my trusty teammate Ben Devlin, and so many others was very special, not to mention how special it is to drive such a high downforce race car. I will miss the experience greatly. As I work hard to find a replacement home in a prototype, I've found another special ride to keep my heart in shape. 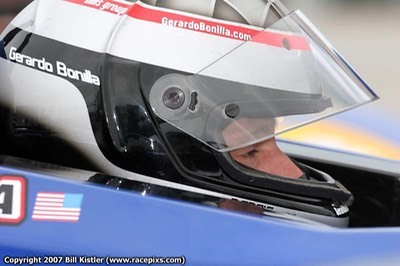 I had previously spent time at the Daytona International Speedway in October and November to network with teams that were preparing for the 2009 Rolex 24 race. I continued with the search by attending this past weekend's final January 3-5 test days for the 24 hour race coming January 24-25. While doing my interview rounds, I was fortunate to meet Joe and Jerome Jacalone, owners of Gotham Competition. 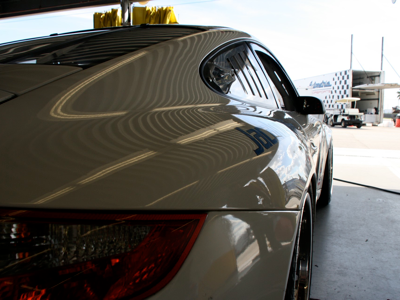 The team is fielding a Porsche 911 GT3 in the GT class for this year's race. They had already hired long-time friend and super fast guy Randy Pobst. Wouldn't this be a great place to enjoy this year's race? 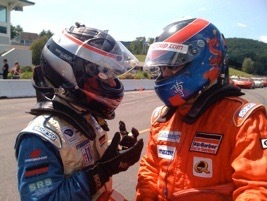 Before anything could be decided, a proper "job interview" in the race car was needed. I drove a handful of laps on Sunday, followed by a few more earlier today. GT cars are old hat for many drivers, but as it was my first time in this category, it became a thrilling learning experience. The laps were enough, and Joe and Jerome were gracious to offer me a seat to share with them. I am delighted to join them! Their crew is a hard working group that carries a positive feeling all around. Driving with Randy is the realization of a goal set fifteen years ago when I first got to know him. It will be a very special race, indeed. Again, many thanks to Jerome and Joe Jacalone for their trust and confidence in me. Thanks, as always, to all of you for your support.